your heart for those spangled superheroes willing to fight for the American way of life? Do you joyously celebrate the 4th of July? Do you admire the Pledge of Allegiance, Old Glory, Lady Liberty, the Star-Spangled Banner? Do you hum the National Anthem on your drive home? Do you put country first? 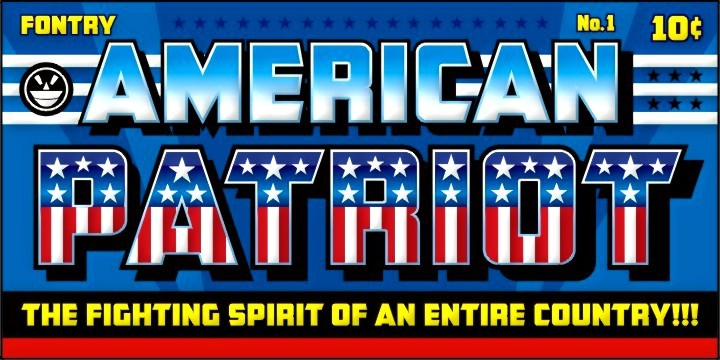 CFB1 American Patriot was inspired by the patriotic lettering styles that arose out of the golden and silver age of comics, when real heroes dawned the stars and stripes and battled the forces of tyranny with fierceness and unashamed pride. The CFB1 American Patriot is offered on limited terms complete with 2 patriotic variations. So start showing off your colors, utilizing the Styles menu to create a truly American layering effect. Be a patriot true! Stack up the layers for the red, white and blue!